I love chai. I don’t drink coffee, so my drink of choice is usually a hot chai. I also love chocolate. However, I had not thought about combining the two until I took a tour of the Theo Chocolate factory when I was on vacation in Seattle a few weeks ago. Yes, I got to take a tour of an actual chocolate factory! No, it was nothing like Willy Wonka, but we did get to eat A LOT of samples. Highly recommended. Did you know chocolate is made from fermented, roasted, and ground seeds of a tree called the theobroma cacao (aka the chocolate tree)? Very similar to the process of making coffee beans. So interesting. And no, Theo is not sponsoring me to write this (I wish!). I just think they’re a cool company doing good things aside from making great chocolate. Now, back to these cupcakes. After having the chocolate chai bar at Theo, I knew immediately I needed to put it on a cupcake. When I think of chocolate icing for a cupcake, I automatically think yellow cake because yellow cake plus chocolate icing is the best. Bold statement, I know. Make these cupcakes with the chocolate chai icing and you won’t be sorry. And then put the chocolate chai icing on as many desserts as possible. Preheat the oven to 350 degrees. In a large bowl, cream the butter and sugar with a hand mixer until light, about two to three minutes. Add the eggs and vanilla and beat for an additional two minutes until evenly incorporated. In a separate bowl, mix the flours, salt, and baking powder. Add the dry ingredients to the creamed butter, sugar, and vanilla one-half cup at a time. Mix after each addition, but do not over-mix. Add the milk 1/4 cup at a time, again mixing after each addition, but being careful not to over-mix. If you over-mix, the cupcakes are going to become too dense. Spoon the cupcake batter into a cupcake tin lined with cupcake liners. Fill the liners about 3/4 full. Bake in preheated oven for 20 minutes or until edges begin to turn golden and toothpick inserted in center of cupcake comes out clean. Yum. Light, fluffy, yellow cupcakes. 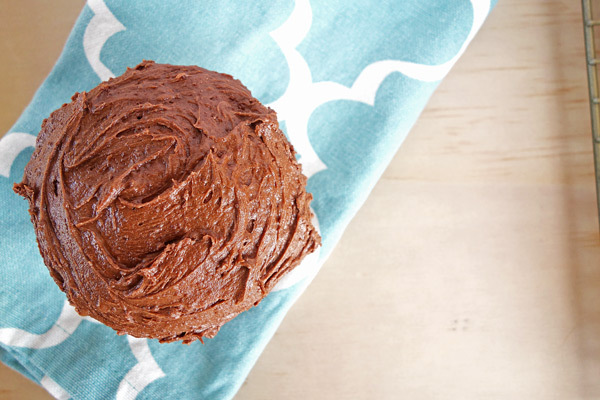 While the cupcakes are baking, make the chocolate icing. It is really easy. I’m serious. 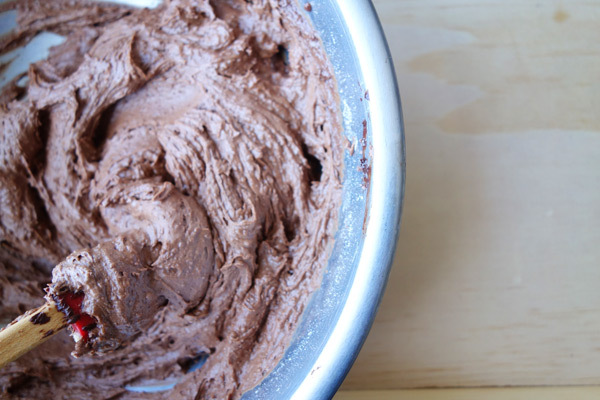 This is pretty much the only chocolate frosting recipe you need. Leave out the chai if you want plain chocolate icing. It is rich, but not so thick that it is fudge-like like some chocolate frostings can be. I like chocolate, but I also like not choking on frosting. Now, with a hand mixer, mix butter and cocoa powder until cocoa powder is completely incorporated. Mix in the vanilla. Slowly add the powdered sugar, mixing after each addition. Another good thing about this recipe is that it is sweet, but not overly sweet. I find many frosting recipes add too much sugar and they are too sweet for me. Mix in the chai powder and milk. The chai I have not only tastes great, but is already in powder form. If you need to, you can grind your own chai. You really want it in powder form so it is evenly incorporated. That’s it. Your chocolate chai icing is done! Generously frost the cupcakes with the chocolate chai icing. Make clean-up easier by licking the spoon. You’re just being efficient. Add eggs and vanilla and beat for approximately 2 minutes more. In separate bowl, mix flours, salt, and baking powder. Add the dry ingredient mixture to creamed butter, sugar, and vanilla 1/2 cup at a time, mixing after each addition. Add milk 1/4 cup at a time, mixing after each addition. Spoon cupcake batter into lined cupcake tin, filling 3/4 full. Bake in preheated oven for 20 minutes or until edges begin to turn golden and toothpick inserted in center of cupcake comes out clean. Mix butter and cocoa powder with hand mixer until incorporated. Mix in vanilla extract. Slowly add powdered sugar, mixing until incorporated after each addition. Mix in chai powder and slowly mix in milk. Add more milk is icing is too thick.